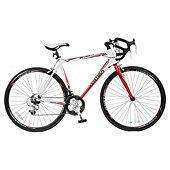 This Vertigo Picadilly road bike is a sleek red and white road bike that you can use to race across town on an errand, or along country roads. The Picadilly has a lightweight 21" aluminium frame with rigid steel forks and is equipped with 700c spoke wheels. Double wall rims give you extra durability with a reduction in the number of punctures you will receive on litter strewn paths. Both the seat and the front wheel are quick release, making it easier to secure your bike when you are locking it up. 14 speed Shimano gears with thumb shift for quick gear changes gives you a wide range of gears to select from. Whether you are free wheeling down a hill or cycling uphill, you will find a suitable gear to match conditions. The Vertigo Picadilly includes front and rear caliper brakes with Promax levers to bring you to a rapid stop during emergencies. This bike is suitable for men with a 26"-32" inside leg. Minimal self-assembly is required. Great reduction. Thanks for sharing! No idea if tis any good or not sure the bike experts on here will tell us but seemed a decent price for a starter bike! Big lad if you use code TDX-TFKT it knocks £10 off for you. 115 - cant be bad at that. It is a decent price. But I would seriously consider changing the breaks if you're going to use it for long journeys. It also has a steel fork which will be heavy and clunky. I doubt you would need to change the whole braking system....just upgrade the pads. Not even a thanks or mention for the code! Tut tut. As it is almost like riding 2 decent bikes clipped together it will be good for muscle building ha ha. Can you link to a lighter bike for this sort of price? I doubt you would need to change the whole breaking system....just … I doubt you would need to change the whole breaking system....just upgrade the pads. It has a breaking system? What's that for then? As it is almost like riding 2 decent bikes clipped together it will be … As it is almost like riding 2 decent bikes clipped together it will be good for muscle building ha ha. m: mass, \gamma: friction coefficient, v: velocity (first order, but good enough). an 80 kg rider would need to overcome about 9% higher rolling resistance at the same speed on the heavier bike. However: the cyclists' main "enemy" is air drag. There, the velocity enters squared, so double speed = four times air drag. It depends also on the surface and shape of the object that is "dragged" through the air, so a more aerodynamical seat position will be more important than a light bike (the velocity needed here is the relative air speed, not the speed over ground, as everybody can tell who has eve ridden against the wind). The air drag plays usually the dominant role in cycling, rolling resistance is less important but still important enough. This is only for a bike that is traveling on the plane and has reached it's final speed. In order to reach your final speed, you have to accelerate the extra mass (9% more). A heavier bike is also a problem when climbing (complete system is 9% heavier). For the money I can't see how you can complain really, change the pads (£5 or so) and you should be nice & safe. Ride it for a while & upgrade in a year or so if you want to and not lose much on it. Just make sure you pay the extra £50 to have your local bike shop set it up correctly, unless you have half a brain cell & can use a spanner! Someone please post that watchdog link, not laughed so much in ages! Joking aside...due to this having dropped handle bars it will be faster than a mountain bike or hybrid due to the aerodynamics and the narrow tyres on this will also give less rolling resistance than nobly off road tyres..
Big lad if you use code TDX-TFKT it knocks £10 off for you.115 - cant be … Big lad if you use code TDX-TFKT it knocks £10 off for you.115 - cant be bad at that. can't you also use code TDX-KPHM to take another £10 off. for 1st time customers but can set up a new account i suspect. slamdunkin is right and even when going uphill when the weight matters more you only need 10% extra power. I'd still suggest beginners buy a cheap mountain bike or hybrid instead. slamdunkin is right and even when going uphill when the weight matters … slamdunkin is right and even when going uphill when the weight matters more you only need 10% extra power.I'd still suggest beginners buy a cheap mountain bike or hybrid instead. Why would you buy a MTB if you're wanting to ride on the roads? A hybrid maybe but for anybody wanting to do any sort of distance on a road then a road bike is easily the best option. Why would you buy a MTB if you're wanting to ride on the roads? A hybrid … Why would you buy a MTB if you're wanting to ride on the roads? A hybrid maybe but for anybody wanting to do any sort of distance on a road then a road bike is easily the best option. A comfortable lighter hybrid is sub £200 too. Looks? Roadies are bigger snobs. You will get plenty of looks I assure you. The gearing system on this is also dangerous compared to a proper road bike or hybrid. A comfortable lighter hybrid is sub £200 too. Looks? Roadies are bigger … A comfortable lighter hybrid is sub £200 too. Looks? Roadies are bigger snobs. You will get plenty of looks I assure you.The gearing system on this is also dangerous compared to a proper road bike or hybrid. Have you got a link to the hybrid you're talking about? How is the gearing system dangerous? Nope, I would recommend a hybrid (or 2nd hand bike if you know your stuff) for all beginners without the cash for better. The main problem is the awful gear system. Weight is certainly less important. Seems I missed the thumb shift. No doubt it uses the hybrid shifter. If it uses a thumb road shifter its actually a great buy. By road shifter I mean a combi brake/gear shifter. Its much safer. Stop spouting ill informed Gibberish. Would this bike be a bit on the small side for someone over 6'? I.m 6.1 and need a 23.5 inch frame on a road bike with this kind of geometry.....where as on a MTB a 20in frame is fine. Having said that two people of the same height can differ in leg and torso length. "Stop spouting ill informed Gibberish." Either that or you have very limited experience of bike types and parts. Its a cheap bike and some will buy it. Don't inflate it. "Stop spouting ill informed Gibberish. "Either that or have limited … "Stop spouting ill informed Gibberish. "Either that or have limited experience or bike types and kit.Its a cheap bike and some will buy it. Don't inflate it. I suggest you go back to the beginning and read you posts again. If you hadn't spouted so much tripe I wouldn't have had to post accurate information. The reason we have road shifters built into the brakes is because its safer. If this ain't got that there is plenty of chance newbies may be terrified changing gear. I know plenty of experienced bikers who wont go on the roads. If you really knew your stuff you would inform and/or be interested which you are obviously not. Go troll somewhere else, idiot. I for one am happy to see a bike deal on here that isn't £1500+, which there has been a lot of lately. I think that "buy cheap buy twice" applies here. If you only have £120 to spend, buy second hand. The reason we have road shifters built into the brakes is because its … The reason we have road shifters built into the brakes is because its safer.If this ain't got that there is plenty of chance newbies may be terrified changing gear.I know plenty of experienced bikers who wont go on the roads.If you really knew your stuff you would inform and/or be interested which you are obviously not. When I was in my teens I road to Devon and back from East Sussex on a bike of this shape (we called them racers then) it had the gear selectors on the down tube as was the norm for many years...I am still here to tell the tail. I sometimes use my hybrid for up to 100 miles a day of training. When actually competing a switch to a road bike is a necessity. Obviously if a road bike is a necessity then something lighter is too Shezza ! I was the same as you slamdunk. I only switched to hybrids recently for a touring expedition . I did up to 150 miles a day. The hybrid was for the 30km mountain climbs whilst carrying 30KG in total. Having read your ill informed post here, I don't believe a word of it. Yes, all very interesting, but as with most random physics interpretations it’s complete rubbish when converted to the real world. Rolling resistance doesn’t just magically disappear when you “reach the speed”, the heavier your bike is the more energy you need to use in order to maintain that speed. The lower the weight of the cycle, the higher your average speed is likely to be, and the more likely you are to enjoy the activity (pretty important as mindset plays a big part in how fast you cycle…). I have two road bikes; one weighs 11.5 kilos, the other 8 kilos. That drop of over 3 kilos makes a phenomenal difference, shaving 6 minutes off my 6 mile commute (27 mins down to 21 mins). It’s not just that it climbs faster, it also accelerates much quicker. The proviso is, of course, that you have to be putting the effort in. If you just pootle along (as most people who ride Bike Shaped Objects would do), then weight is likely as not going to make the slightest difference. And regarding air drag, unless you’re running on full slicks (and most commuters aren’t) then it’s not really a (genuine) issue as you won’t be going fast enough. Even then, a lot of it is just down to clothing (i.e. don’t wear baggy shorts). Anyway, back on topic - regarding the bike in question, it’s probably a pile of poop, but you aren’t going to get anything substantially lighter/better for the price and (despite my hatred of roadies) my personal recommendation for any commuters would always be a road bike unless you really do need to go off-road (i.e. ignore idiotic laughable suggestions that you are better off on a mountain bike on the road).